One of the hardest times in our walk with Christ is when we find ourselves in the wilderness. Many of us have heard of these experiences before actually experiencing them. Some of us think that they are ‘quick’ tests of faith and will get through them in a short time. When we realise that these wilderness experiences are NOT short but at times lengthy, we begin to look for short-cuts. We find ourselves taking control and doing things the way we see best so that we can get back to a more ‘happier and joyful’ life. I have been going through my own personal wilderness this past year. When I read this passage of scripture in Numbers, which I’ve read many times before, the Holy Spirit showed me something I hadn’t grasped before. 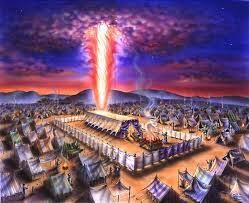 The only way the children of Israel were going to get through their wilderness was to keep their eyes glued on the cloud by day and the pillar of fire by night. God was teaching them an absolute imperative lesson in trust and obedience – in Him. 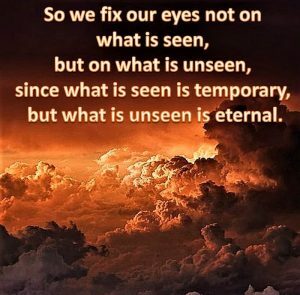 Divine guidance is only learned by fixing our eyes on God and moving when He moves and staying put when He stays. Jesus, our supreme example lacked nothing from His Father because of this principle. He is the perfect imitator of God the Father which sets the foundation for us. Jesus was fixed on His Father! To honour Father God is to imitate what He through Christ has modelled to us. 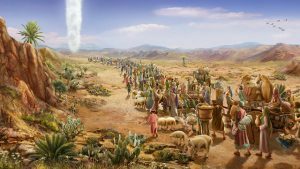 The wilderness, whether trials or temptations, times of not Moses spoke to the Israelites in Deuteronomy 1:32-33 – (The Message), “But now you are here, you won’t trust God, your God – this same God who goes ahead of you in your travels to scout out a place to pitch camp, a fire by night and a cloud by day to show you the way to go.” hearing from God nor feeling His presence, can be the best time to learn, through following the Cloud by day and the Fire by night, to trust and obey. Our security in Him will become a reality and nothing can take that from us! If you are in a situation in which you don’t know whether to move or not, or which way to go…fix your focus on the Cloud!